Stairlift for Sale. That was the dream when Brian Cooper and Mike Mooney decided to take the plunge and set up BM Stairlifts all the way back in 2005. The B and the M as you can guess represents the two owners!! Very creative lads!! Anyway, ten years ago, the aim for Brian and Mike was to get the message out and let Ireland know that BM Stairlifts were up and running with the message ‘Stairlift for Sale’. The journey has been long and hard with annual growth even throughout the recession that hit Ireland from 2008. Mike retired in 2014 and the reins are now in the capable hands of the very experienced Brian Cooper. And he still has the same drive and message that he had in 2005….Stairlift for Sale! Stairlift for Sale – The Sales Figures….. This year BM Stairlifts are very close to doubling the number of stairlifts installed since 2011. In fact in 2011 BM Stairlifts installed 156 stairlifts throughout Ireland, and to date this year Brian and his team have installed 264 stairlifts. An incredible achievement in tough economic times. Brian says that he puts the phenomenal growth down to the word of mouth referrals from our very happy customers. Below is a graph illustrating our growth from 2011 to today! For the curious type, the breakdown between straight and curved stairlifts for 2015 is: 114 Straight and 150 Curved, interesting! It seems more people have curved stairs! 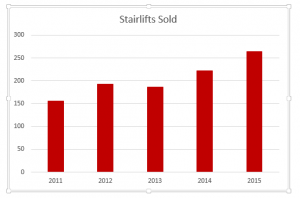 Stairlift for Sale – The Future….. The BM Stairlifts team have huge plans for 2016 and Brian still has the mantra ‘Stairlift for Sale’!! So, with that in mind, I must get back to work! If have any enquiries about stairlift grant, if you in fact have a second hand stairlift for sale or would like to enquire as to a stairlift installation contact the team at BM Stairlifts and we will answer any questions that you might have. Jen or Jacinta are available on 1890-837274 or email info@bmstairlifts.ie.